Ross, Richard. Juvenile In-Justice. Richard Ross, 2012. 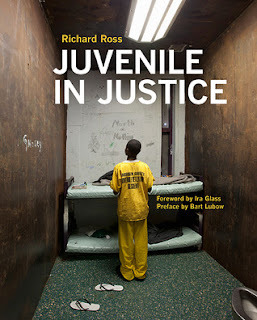 From Goodreads: "Winner of the 2012 Best News and Documentary Photography Award from the American Society of Magazine Editors for a selection published in Harper’s Magazine, the photographs in Juvenile in Justice open our eyes to the world of the incarceration of American youth. The nearly 150 images in this book were made over 5 years of visiting more than 1,000 youth confined in more than 200 juvenile detention institutions in 31 states. These riveting photographs, accompanied by the life stories that these young people in custody shared with Ross, give voice to imprisoned children from families that have no resources in communities that have no power." Recommended for: Any adults who work with teens, teenagers themselves, people who are interested in learning more about the justice system, people interested in photography. Red Flags: Well, the kids are in prison for a reason, so there is discussion about drug use and various other illegal activities, but this is nonfiction, so it's not exactly glorified.